Riding with Alan Gibbs in his Jeep, we went down to the edge of the harbour to look at the Goldsworthy. We had to drive out along a shell bank with the water lapping at both sides. The end was blanketed by a vast flock of roosting oystercatchers waiting out the high tide. Shells crunched under the tires and the wind tugged at our jackets as Alan inched the vehicle towards the birds. In wave after wave they quietly, unhurried, lifted into the air, borne on the shore breeze with only the slightest movement of their wings. Hovering, they drifted out a little into the wind and back over our heads to settle again behind us. We stopped. The teeming birds formed a silent arc over our heads that echoed Goldsworthy’s stone arches marching through the shallows next to us. I caught a glimpse in this moment of how one could be tied to such a place. It is the sort of place that makes one pause; take time; take time out. Though it is the antithesis of many other things in life, it also has the power to tether one to life. 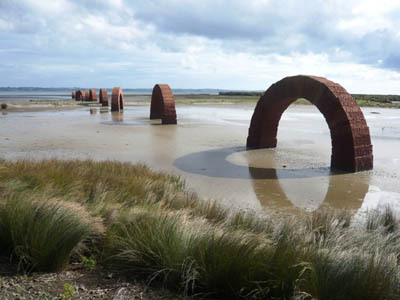 Seeing him here, traversing the rolling landscape of his 1000 acre New Zealand property, talking about one sculpture after another, is to feel Gibbs’ excitement for the place and the art. He is as enthusiastic as a boy in a toy store; and with good reason. When he bought the land now laconically known as The Farm, in 1991, he already had three decades of significant art collecting behind him. Commissioning art works was in the back of his mind “but not the major purpose” of searching for a rural retreat. Looking back, it is clear now that 1991 marked the beginning of a whole new art collecting adventure for Gibbs. He is a rare breed for several reasons. He has made a total commitment to open-brief commissioning of major site specific works from key artists. He is forming a collection of permanent private commissions of the scale that nowadays are more often temporary and the province of public institutions. And he has adopted an expanded role as collector. By rolling up his sleeves alongside the artists, he too faces the boundary-pushing challenges that come with an open brief: to play, puzzle and solve. Gibbs has become the artists’ accomplice and is often, as a consequence, the art producer. Alan Gibbs and his then wife Jenny started collecting in the 1960s. By the early90s when they parted company, they had amassed probably the best collection of works by key New Zealand artists including Gordon Walters, Colin McCahon, Milan Mrkusich, Stephen Banbury and Max Gimblett. After starting with an interest in abstract expressionism, Gibbs admits to “a fairly developed taste for abstract minimalist art.” This has informed the selection of artists for his rural New Zealand project just an hour’s drive north of Auckland. he land has first place in Gibbs’ heart. It is a place where he can relax and play. The art collecting comes second to his project of re-shaping the landscape through an ongoing programme of softening gullies, re-contouring ridges, restoring wetlands by building lakes, and devising the best tree-planting approaches. Further, The Farm is his home for only three months of every year, for he is very involved in his London-based business. Gibbs is one of New Zealand’s most successful entrepreneurs. He has achievements in engineering, manufacturing, diplomacy, merchant banking and telecommunications; and is now active as founding chairman of Gibbs Technologies, the world leader in the development of High Speed Amphibian technology. Richard Serra’s Te Tuhirangi Contour oscillates between two characters too, no matter how often I see it. 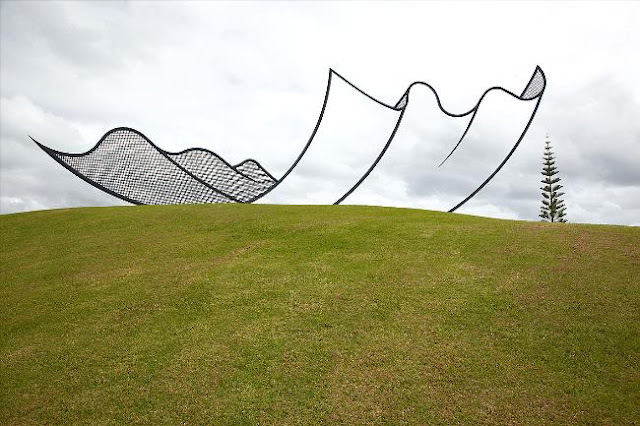 Viewed from any of the ground above it, the 257 metre steel wall has a delicate quality like a dark ribbon curling, almost floating across the evergreen pastures. The deception is beguiling until one walks nearby and underneath the 6 metre high sculpture. Here one is confounded by an altogether different experience. From the downhill side Te Tuhirangi Contour has all the mass of a giant dam filled with water. Each of the 56 steel plates leans out by 11 degrees from the vertical, so the materiality of mass and form impose themselves dramatically as something more felt than seen. 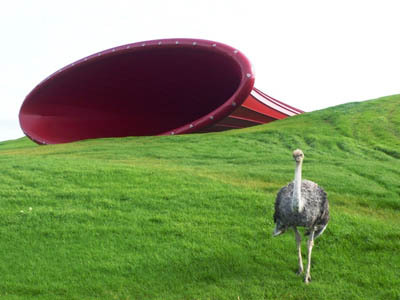 Serra said that he wanted to create a work that in some way “collects the volume of the land;” and he has.